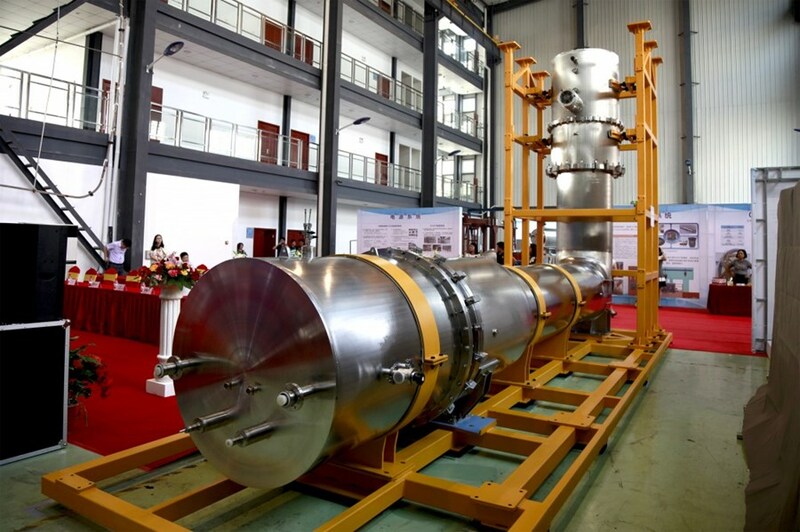 In a major milestone for the ITER magnet procurement program China has successfully completed the first manufactured component of the feeder package: the cryostat feedthrough for poloidal field coil #4. The 10-metre, 6.6-tonne component is on its way now to the ITER Organization. A representation of the lowest level of the Tokamak Complex, showing the feeder that will service poloidal field coil #4. The cryostat feedthrough on its way to ITER (in yellow) is the part of the feeder assembly that crosses the bioshield and cryostat. Measuring 30- to 50-metres in length, ITER magnet feeders will relay electrical power, cryogenic fluids and instrumentation cables from outside of the machine in to the superconducting magnets, crossing the warm/cold barrier of the machine. These complex systems are equipped with independent cryostats and thermal shields and packed with a large number of advanced technology components such as the high-temperature superconductor current leads, cryogenic valves, superconducting busbars, and high-voltage instrumentation hardware. Of the 31 feeders distributed around the vessel—and all supplied by China—six will service the poloidal field coils. The component that is now en route to ITER is the cryostat feedthrough for poloidal field coil #4—the first magnet component required on site because it needs to be brought into position before the completion of the cryostat base support ring. Two other components—the in-cryostat feeder (nearest the vacuum vessel) and the coil termination box (outside the bioshield)—will complete the feeder that connects to the fourth poloidal field coil. Despite a simple outward appearance, feeders are complex systems that are equipped with independent cryostats and thermal shields and packed with a large number of advanced technology components (high-temperature superconductor current leads, cryogenic valves, superconducting busbars, high-voltage instrumentation hardware). Feeders are the highways that relay electrical power, cryogenic fluids and instrumentation cables from outside of the machine in to the superconducting magnets. At the Institute of Plasma Physics, Chinese Academy of Sciences (ASIPP) in July approximately forty scientists and engineers from the ITER Organization, the Chinese Domestic Agency, the European Domestic Agency, ASIPP and suppliers Keye Company and Henxing Company, took part in a milestone ceremony. ITER Director-General Bernard Bigot, who could not be present, sent his "warmest heartfelt congratulations" to the team members from different institutes who had all come together to realize this significant accomplishment according to schedule. Arnaud Devred, who has led the Superconducting Systems & Auxiliaries Section at ITER for ten years—and who has made the "journey east" dozens of times—voiced his great sense of pride. "The feeder system involves some of the most difficult and risky manufacturing and assembly processes of the ITER Tokamak, but thanks to the hard work and dedication of the teams at the ITER Organization, at the Chinese Domestic Agency, and at ASIPP and its subcontractors, we learned how to work together and to reconcile our cultural differences to meet the tough technical and quality control standards of the Procurement Arrangement. If we are at this successful point in the program today it is because, at our level and for our scope of the ITER Project, we have been able to develop the good collaborative spirit and mutual trust that has enabled us to overcome hurdle after hurdle and to achieve our common goals. I can only wish that the cryostat feedthrough for poloidal field coil #4 remains a testimony to common will power and shared resilience." 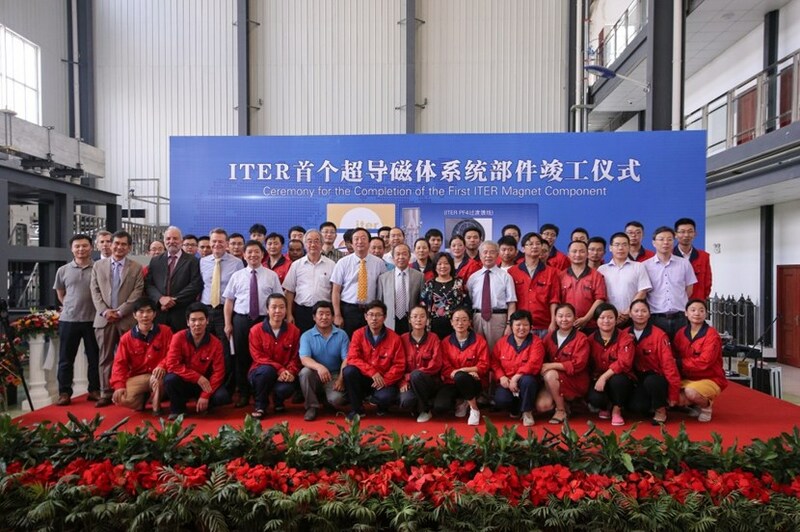 An industrial milestone to be celebrated: late July, representatives of the ITER Organization, the Chinese Domestic Agency, the European Domestic Agency, ASIPP and suppliers gathered the mark the shipment of the first completed magnet component to ITER. The ceremony was especially poignant to Arnaud because he was just one month from leaving ITER to join the Large Hadron Collider Luminosity Upgrade at CERN that calls for the manufacture and installation of niobium-tin (Nb3Sn) dipole and quadrupole magnets—a type of superconductor that is massively used in the toroidal field and central solenoid coils of ITER. The complete magnet feeder system will weigh more than 1,600 tonnes and integrate more than 60,000 individual components.